Pedestrians in Times Square walk past a police car May 26, 2004 in New York City. The U.S. fears that al Qaeda may be plotting an attack inside the country or against U.S. interests abroad. Despite these warnings, the government has no plans to raise the terror threat level and has no details on when, where or how an attack might occur. EAST HARLEM — A 19-year-old cyclist was struck and killed by a cab at the corner of 108th Street and Park Avenue on Monday night, police said. 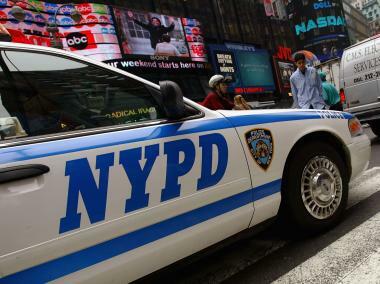 The cyclist, who police have not yet identified, was heading east with traffic on 108th Street around 7:50 p.m., according to an NYPD spokeswoman. The cab was traveling on 108th and had the green light, the spokeswoman said, when the cyclist entered the intersection and was struck by the cab. The cyclist was taken to Mount Sinai Medical Center, where he was pronounced dead at 2:35 a.m., police said. The driver stayed on scene waiting for police to arrive, police said. No criminality is suspected. The accident comes amid accusations that the NYPD is going easy on drivers involved in fatal accidents with cyclists. At a City Council hearing in February, relatives of pedestrians and bicyclists charged that police were failing to properly investigate motorists involved in fatalities. And in April, a study by transportation blog Transportation Nation examined instances when a cyclist died or was likely to die in a traffic accident. The blog, a partnership of public radio stations throughout the country, found that "forty percent of the time, there’s not even a traffic ticket" for drivers involved in the accidents. Last week a group of politicians in the City Council announced new legislation called the Crash Investigation Reform Act, which would examine the procedures NYPD uses to investigate accidents. "We're hopeful that it will get a serious look," said Andrea Bender, a spokeswoman for Councilman James Vacca, one of the council members who announced the legislation. "We certainly think that more needs to be done on the investigation side."